The Live At Pompeii LP Boxset showcases the entire concert on 4-LPs, with 2 gatefold sleeves, poly liner inner sleeves, booklet, and slipcase. Returning to the Pompeii Amphitheater stage 45 years after his last performance for Adrian Maben’s Pink Floyd: Live at Pompeii, David Gilmour continues to be the only performer to play to an audience in the arena since the gladiators, almost 2,000 years ago. Speaking about the Pompeii shows David Gilmour commented “It's a magical place and coming back and seeing the stage and the arena was quite overwhelming. It's a place of ghosts…” Hear for yourself the best of these haunting and powerful shows on this exclusive 4-LP set. Great addition to my collection. Enjoyed it very much. Doing this album in Pompeii was awesome. I purchased the vinyl set and could not be happier. The mastering is expertly done and the production quality is perfectly balanced. Light some incense, turn off the lights, start the music, close your eyes and then enjoy. You won't be disappointed. BTW, very fast shipping. Saw the movie in the theater which was awesome so had to get the album. The vinyl pressing is great! For a live recording the sonics are incredible. If you have a turntable this is a must buy! Very good packing and the records are very good to" love it" þó hun hafi kostað 17000þ kall hingað kominn til Reykjavík, Iceland . Bought as a gift for my son. He loves it. The music is great. A wonderful set. Live at Pompeii-4 LP set Wonderful! Excellent recording quality, Beautiful photo booklet. Thank you David! 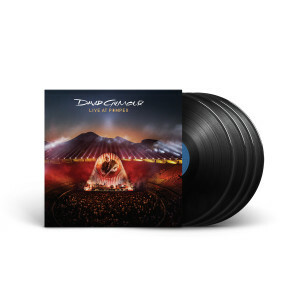 David Gilmour Live at Pompeii 4 LP received in perfect condition, on time. David Gilmour/Chicago 2016........I saw the best concert of my life. I'm now reliving every note, and though I wasn't at Pompeii, I'm there now. This release is an audio heirloom and sits proudly stacked next to Live in Gdansk in my vinyl collection. Pompeii is a beautiful presentation that is recorded and mixed flawlessly. Shine on.